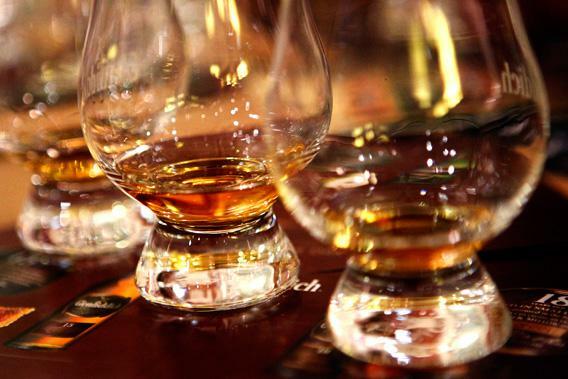 The end of peat: Is Scotch drinkers’ favorite flavor running out? Peat is not a renewable resource. What does that mean for my favorite Scotch whiskies? After a short trip abroad last fall, I flew into O’Hare and wheeled my suitcase directly to the duty-free Scotch. The shop’s small, sturdy clerk spoke in a legit Scottish burr, and his palate, finely calibrated to the nuances of his home country’s malts, had so far survived the brats-and-beers onslaught of Chicagoan cuisine. He helped me find the shop’s largest bottle of Ardbeg, from Scotland’s Islay region, and praised its earthiness and smokiness. Beverage-journalism words such as earthy and smoky are often poetically opaque, but in the case of whiskies from Islay (pronounced AISLE-uh), they can be taken literally. Before these whiskies are fermented, barley is sprayed with water, which causes it to sprout and increase in sugar content, and then dried over the aromatic smoke of a peat fire. The process yields an intense (to some, repugnant) complex of flavors and aromas: clove, banana, and butterscotch, but also burning tires, Sharpies, Band-Aids, and synthetic insulin. The diminutive, knowledgeable clerk—basically Gimli from Lord of the Rings in an O’Hare-issue waistcoat—told me that back when Ardbeg was first becoming commercially available, he’d see avid Scotch drinkers, used to the unpeated, floral malts produced in other parts of Scotland, spit it out in disgust. Tastes have changed: Islay’s superbly gnarly Laphroaig, once beloved by only a few, is suffering a shortage of its definitive 10-year expression, and, according to Gimli, high demand in Asia has made it impossible for his shop to stock Lagavulin, Islay’s ritziest whisky. Peated whisky’s dramatic rise in popularity is annoying when you can’t find your brand at the liquor store. But hearing Gimli’s anecdote about Lagavulin made me wonder whether a darker problem was on the horizon. Peat is not really a renewable resource—a peat bog takes thousands and thousands of years to form. And Scotland isn’t a big country; it’s about the size of South Carolina. How long, I wondered, could Scotland continue to burn its peat before it would all be gone? Were we in a fool’s paradise, an epoch of superb whisky that would end when the last spadeful of Scottish peat is dug up and flung into the furnaces? There was something suspiciously glib about this response. Despite the sensitivity of his palate and familiarity with the Scotch supply chain, I was pretty sure Gimli was extemporizing, trying to hustle me out the door. What was Gimli hiding? The peat that the Scotch industry burns by the ton to make peated whiskies isn’t renewable, but it’s not quite a fossil fuel either. A sort of proto-coal, peat is a mush of partially decomposed plant matter that lies on the surface of the Earth and accumulates imperceptibly, by about a millimeter a year. It only forms in places where a handful of climatic conditions are in balance. Soil chemistry, density of flora, precipitation, temperature, humidity, and average wind speed must be just so, yielding a habitat with more rainfall than evaporation can subsequently carry away. When all these variables line up, plants never fully decompose; an initial, brief round of decay produces a bath of weak acids that prevents any further decomposition. Over centuries, mummified plants pile up and get compressed into a carbon-rich gunk that resembles crumbly, wet Oreo cookies. Give it a few more million years, and this peat turns into coal. In peat-rich regions, which are located mostly in Northern Europe, Canada, and Russia, people have long burned the gunk for heating and cooking. For most of human history, consumption was at the household level and without serious consequences. However, in at least one place, Ireland’s Blasket Islands, the peat resource was totally exhausted. (For this reason, the islands have been uninhabited since 1953.) In the past 150 years, peat consumption ticked up as it became a primary fuel in some power plants, though most of these plants are closing or reducing the amount of peat they burn. Every year, about 25 million tons of peat are harvested and burned, by individuals, power utilities, and companies of various kinds (including, but not limited to, distilleries). Another 14 million tons are used by farmers, landscapers, and gardeners to amend deficient soil. Peat keeps golf courses looking sharp. As massive as these numbers are, they amount to about 0.1 percent of the global peat resource. An additional 10 percent of the global resource has been lost to real-estate development and agriculture. Thankfully, the majority of the Earth’s peatlands remain undisturbed. Jean-Yves Daigle, outgoing chair of the Canadian National Committee of the International Peat Society, estimates that there are around 1.5 million square miles of peatland on Earth. This figure only scratches the surface: Square miles measure surface area, but peat deposits can be up to 60 feet deep. (Neuzil reported this anecdotal figure in a stage whisper, as if it were a shamefully tasty rumor.) So, Daigle says, call that between 5 trillion and 6 trillion tons. He reckons that we are using about 0.05 percent of this resource every year. If the trend holds, and if the incidence of peatland fires—such as one that burned uncontrollably in Minnesota last year—doesn’t increase dramatically, that works out to another 2,000 years of Scotch. However, Neuzil told me that if peat were used only to make Scotch, its most noble purpose (my words, not hers), the supply would never run out. Accumulation would keep pace with consumption, and from now until the end of time there would be Scotch on Earth. This obviously isn’t going to happen. In fact, the coming fossil-fuel crunch could make the peat situation—and therefore the Scotch situation—a whole lot worse. As the price of oil and coal rises in concert with scarcity, peat could well be reassessed as a source of energy. Peat consumption could skyrocket, ringing down the curtain on peated Scotch forever. Meanwhile, its combustion for fuel would fill the air with ever more carbon dioxide, making the Earth uninhabitable. I hope it works out differently. If civilization is to end in an anthropogenic climatological hell, it would be nice to have the option of toasting it with a glass of something heavenly.